Feta is an ancient cheese. In Homer's Odyssey, Ulysses found feta in the cave of Polyphemos the Cyclops. Feta is also a much maligned cheese, copied everywhere, made with more care for the bottom line than for flavor. Until recently anyone could call their cheese feta and the country that made the most feta in the world was Germany. Now there are only a few locations that can make the real thing and the island of Lesbos is one of them. 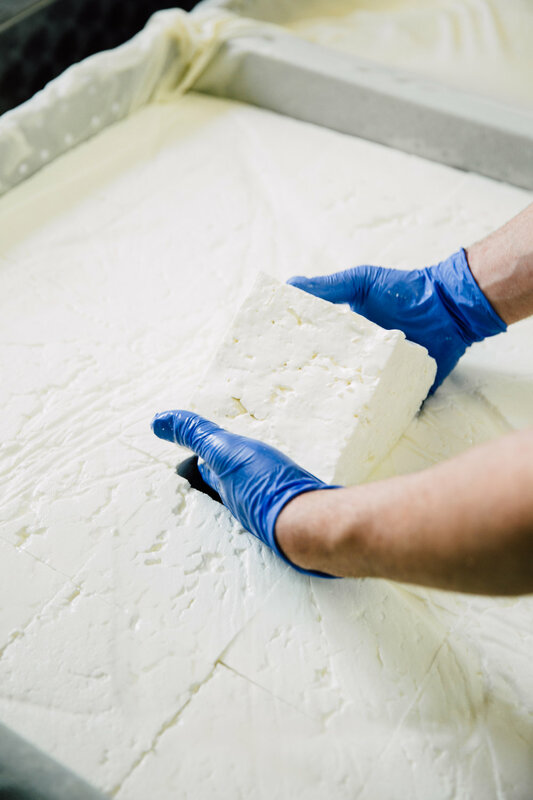 Essex feta is made exclusively from the milk of Lesbian breed sheep, whose shepherds retain a millenia old practice of grazing them on the sun-and-sea splashed hills on the hiss around the village of Agra, on the western side of the island. 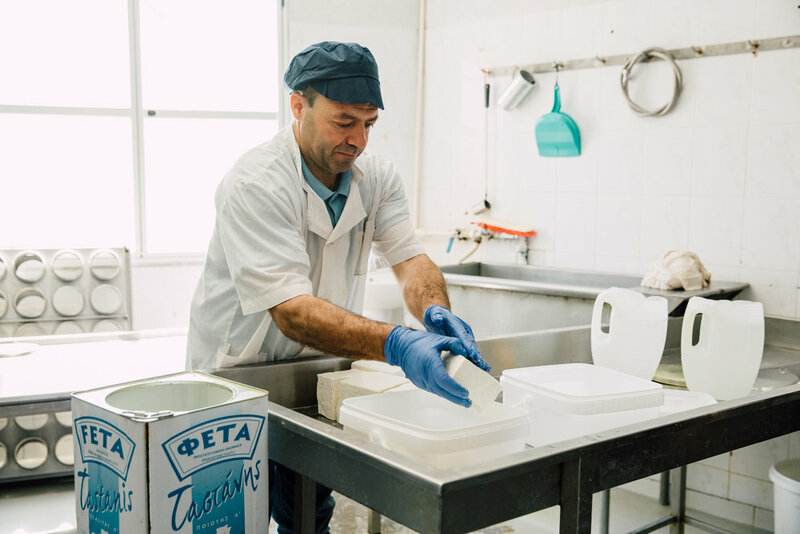 Panagiotis Tastanis, pictured, is the second of three generations behind Essex Feta. His nephew, Demitri, pictured in many of the make images above, works alongside him in the creamery every day. 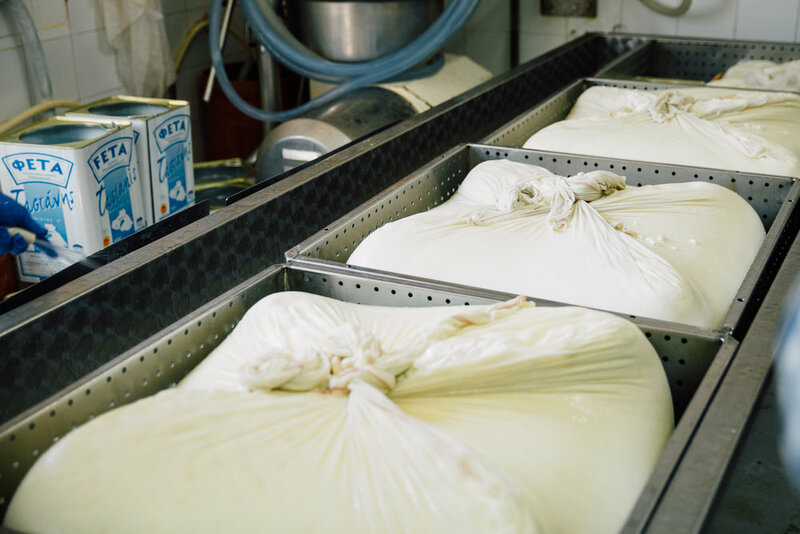 They make traditional brine-bathed feta, using just sheep's milk from the hills nearby and sea salt from the four hundred year old salt pans at Kalloni. Feta's texture can be hard, soft and everywhere in between. How it's made and how long it's aged changes its texture and how it's used in the kitchen. In the U.S. we're used to harder, crumblier feta. Essex feta will be much softer by comparison. This is gentle, pillowy feta, more like what the Greeks eat every day. The village of Agra, where Essex feta is made and where the sheep graze, sits on the rim of a volcanic caldera that's been home to sheep and shepherds for ages. There's never been any industry here, it's idyllic. The lush hills are covered in herbs and flowers. The flocks of sheep are small, usually not more than four dozen. You can hear their bells tinkling on the hills. The town of Agra, near the western edge of Lesbos, has a population of about one thousand. People that is. When it comes to sheep there are several times that many. The shepherds work collectively, grazing their flocks in the cool mornings and evenings on the sea-sprayed hills. The shepherds deliver milk to Tastanis twice per day, after the morning and evening milkings.